Celebrate their birthday with a Cake Smash Photoshoot! 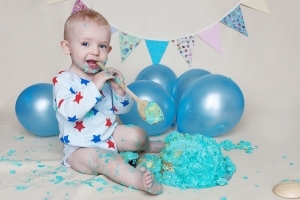 It’s approaching your baby’s first or second birthday, a huge milestone in their life, and yours too, so why not celebrate in style with a cake smash session! You heard right, this may be the only time in their life you will encourage them to make a mess and smash up and cake with their bare hands. These sessions are incredibly fun and both the kids and parents love it! An optional professionally baked cake is supplied and tailored to your choice of style and colour. Make a fantastic memory that will last forever with a cake smash! If you have any questions or require a bespoke service please contact me. Liz photographed my sons 1st birthday cake smash and Charlie loved it, the pictures are absolutely fab! What a great photographer!! SO MUCH FUN! Anyone considering doing a cake smash for their son/daughter, it’s such fun, Elizabeth made my little Sophia feel completely comfortable and fun. I think I enjoy it more than her! I could not be happier with the shoots and photos I have received from Elizabeth Jayne Photography for both my sons cake smash and birthday party. I would not hesitate to use Elizabeth again and would recommend her highly to anyone wanting to capture those precious moments. Elizabeth has a real knack of ‘capturing the moment’ and I am so pleased I will be able to look back on these moments forever alongside my memories. Truly first class. Thank you.